What is the advantage of comparing and contrasting? The same lesson can be used with other versions of this fable. Say, “Today we are going to read two very different versions of the same story. 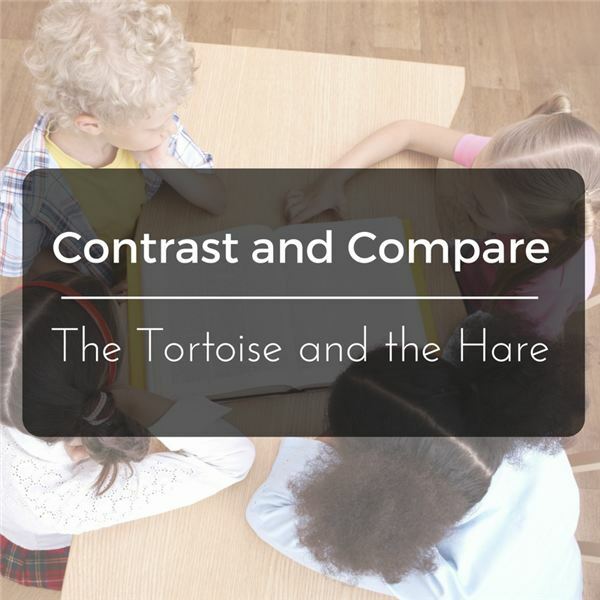 How many of you are familiar with the fable The Tortoise and the Hare?" Discuss what they know about the story. “I want you to know what questions we will be talking about after we listen to the two books." 1. Are the characters in both books the same? 2. Why did they decide to race? 3. How does the tortoise win? 4. Was the lesson the same in each book? 6. Compare the writing style. Read two versions of the book. The main characters were the same but with more personality in the book by Kristyn Crow. In the Pinkney book, there was no mention of why they were racing. In the Crow book, they raced because they were angry that they crashed into each other at the county fair. In both books, the hare fell asleep, enabling the tortoise to win. Yes, the lesson was the same in both books. The Pinkney book has illustrations that are more realistic and detailed. The Crow book’s illustrations are more cartoon-like. The Pinkney book was written with simple phrases and some pages with no text at all. The Crow book was more comical and written in rhyme. Students will write about which book they preferred and list three reasons why. Pinkney, Jerry. The Tortoise and The Hare. Little, Brown and Company, 2013. Crow, Kristyn. The Really Groovy Story of the Tortoise and the Hare. Albert Whitman and Company, 2011.